I would like to thank you for taking your time. You are son of David Flynn, who is sadly along with his brothers, Bruce and Barry deceased and I’m really proud I found you to talk about your father’s and his brothers music. No problem…i am happy to do it. Glad to see interest in what i feel is one of the coolest bands of the ’70s. Were they in any others bands before forming Headstone? Any releases from then perhaps? They had a band called “MOTION”, but, it was just when they were first gettin’ started and playin’ clubs in our general area. How and where did they start the Headstone? Do you perhaps know how did they choose the name? They started practicing in my Grandmother’s house about 1970… they all knew how to play guitars, and were all interested in having fun with it. They decided to start a band, learn some covers and it escalated into writing original material. They played gigs heavily, as well as working day jobs. I feel the same way about that record…. 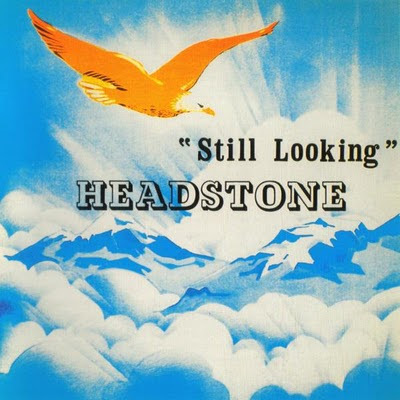 if i were standed on a desert island, and had a pick of five records that i could have with me, “Still Looking” would be one of them. The first seven songs they recorded were; Still Looking, I Like It, Misery, Those Days, Peace of Mind, Springtime and I Love You. 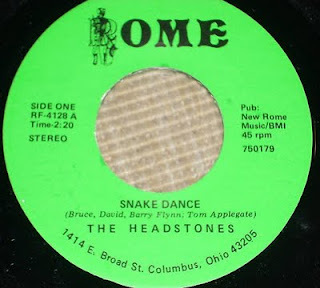 They were all recorded at Rome Recording Studios(Jack Casey, owner-engineer, along with another egineer, not sure of his name) in Columbus, Ohio. They went in on a Friday, and recorded and mixed the album in 2 days. It was recorded on 1/2” 8-track tape. With the excpetion of harmony vocals, one guitar overdub(outro on Still Lookin), and piano on “Misery”, the album was cut live, lead vocals and all. Other tracks: “Buying Time”, “Snake Dance”, “What People Say”, and “Carry Me On” were cut in pretty much the same fashion in 1975. They were refining their sound a little, and their recording technique, as this was only the second session for them. The last two songs, “Ragin’ River”, and “Hey Boy” were sung by David on lead vocals… he said Barry was meant to sing them, but, for some reason, they never had Barry put his tracks on them. They were cut in 1976. There were a few more songs, some of which were recorded, some were not. The master tapes are long gone. On what label was it released and how many copies were made? 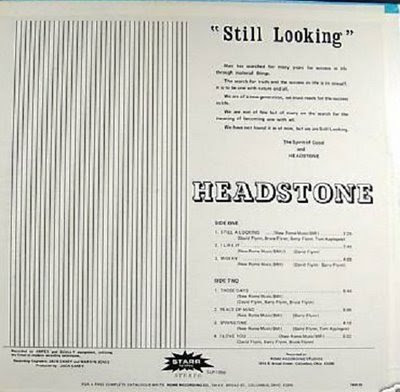 Still Looking was released on Starr Records, and the 1975 songs were released on New Rome Recordings, both of which were affiliated with the studio and Jack Casey(deceased). There were only 2000 copies of the album, and maybe about the same of the ’75 sessions. The 1976 sessions were never finished or released. They are heard as a not completed rough mix. “Man has searched for many years for success in life through material things. The search for truth and the success in life is in oneself, it is to be one with nature and all. We are of a new generation, we must reach for the success in life. We are not of few, but, of many on the search for the meaning for becoming one with all. We have not found it as of now, but, we are Still Looking”. How about touring….where did they tour and with what artists did they perform? They werent promoted by the label, per say, they just did what they could on their own. Hard Rock was dying out in the music industry… its too bad, because this music deserved to be heard around the world. How popular was band back then and what was the scene if you perhaps know? They were very popular in their area…They had some radio play in Texas and on the East Coast. They would pack the clubs everywhere they played. People were into what they were doing… the people were still heavy rock fans, even though the industry wasnt doing much of that at the time. Radio was playing 3 to 4 minute Pop songs. AOR(Album Oriented Rock) Stations were starting to go away. What happened next for them, after the album? doing what they liked. And it showed. You are welcome. Im glad to have the opportunity to shed some light on HEADSTONE and its history. The three brothers basically disbanded in 1977… Tom Applegate was on Hammond Organ. David FLynn on drums, harmony vocals. 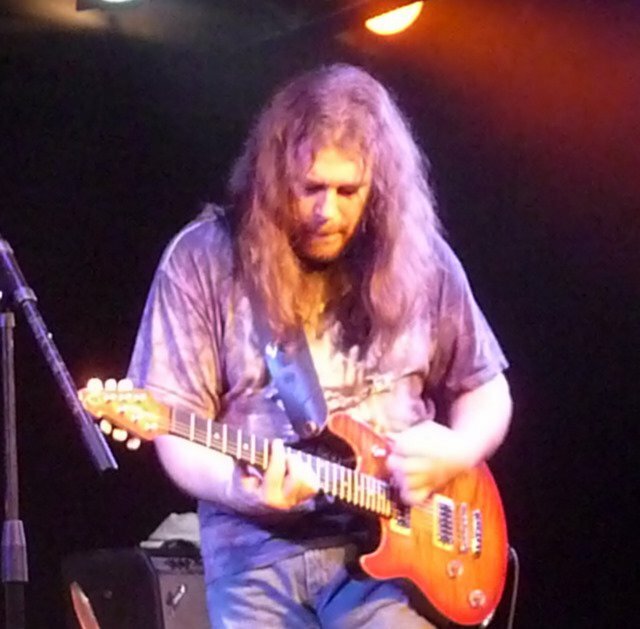 Barry FLynn, bass and lead vocals…and Bruce Flynn, lead guitar and harmony vocals. They really never quit working in the factory for GM(General Motors). David went on to be Plant Supervisor for several years. His job and family kept him busy. He retired from GM in late ’80s and spent time with his family and doing what he loved(drag racing) with his two sons, Brian and Brent, until his untimely passing in July 2006. His brothers, Barry and Bruce worked at GM, also. They took early retirement and shortly thereafter had some health problems. Bruce passed in 2001… Barry passed in 2008. Tom Applegate is still with us and is happily married(and probably thinking about retirement…hehe). Excellent work, great band. I've known about Headstone for 20+ years, but I think this is the first interview I've read related to them. I have the original LP + 45s here. Have those post-45 recordings ever come out? These are my Uncles band. One of the best memories ever was when they played at my high school dance, so cool! All the fun we had at Grandmas listening to em play. This is a wonderful story. Brent u did a great job, Luv u cuz.